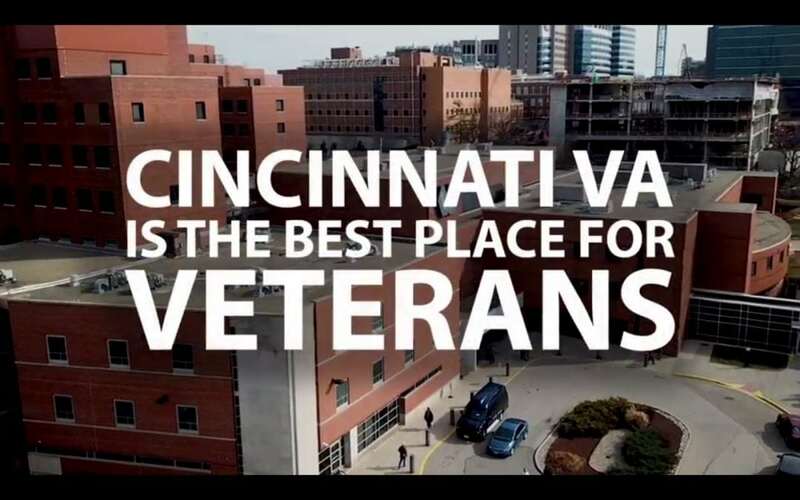 The Cincinnati VA received some negative press several years ago, brought in a troubleshooter from the Dayton VA, and started to rebuild their reputation in the region. The area has a high concentration of veterans, yet, enrollment isn’t where it should be. 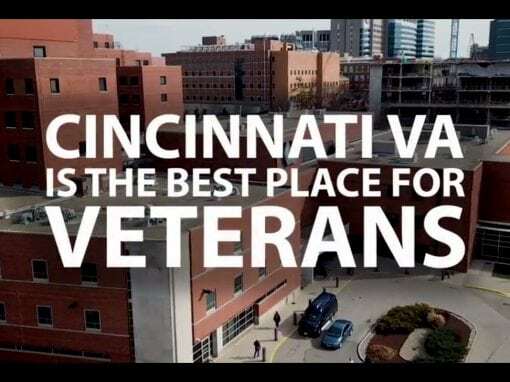 The Next Wave was chosen to help tell the story of why the Cincinnati VA is the right place for veterans to be. We did a series of 8 videos over the course of the year. The client said it has been a good partnership and the videos have been making a great impact on how his office has been able to change public perception and scrutiny. We’re a Certified Service Disabled Veteran Owned business, and this has been one of the most personally rewarding projects we’ve ever worked on. Window companies are a dime-a-dozen, with their high pressure sales tactics. Window salespeople are typically one rung up from used car salesmen and ambulance chasing lawyers. Differentiation from the rest of the pack was essential. Formerly called Columbia Gas Windows, we devised not just a name, but wrapped this veteran window man’s approach all into one, short, sweet name. 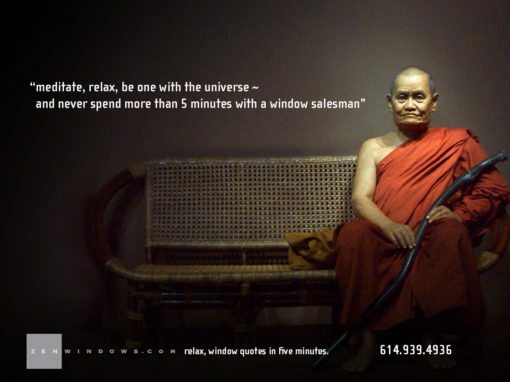 The tagline closed the deal: “Relax, window quotes in about 5 minutes.” The laid back, understated cool was called the most brilliant move ever by the client. Our client had done business the “traditional way” for 15 years and came to us to see if he could Zig while the rest were Zagging. Our response was an emphatic “No! …you need to ZEN”. Our strategy was to offer an alternative experience for the window-buying public. We named the company, created the branding and have delivered positive results. Our client states that he has never sold so many windows, so easily and effortlessly. This is a case where less time selling means higher sales. The five minute consultation also means happier, more zen-like customers. 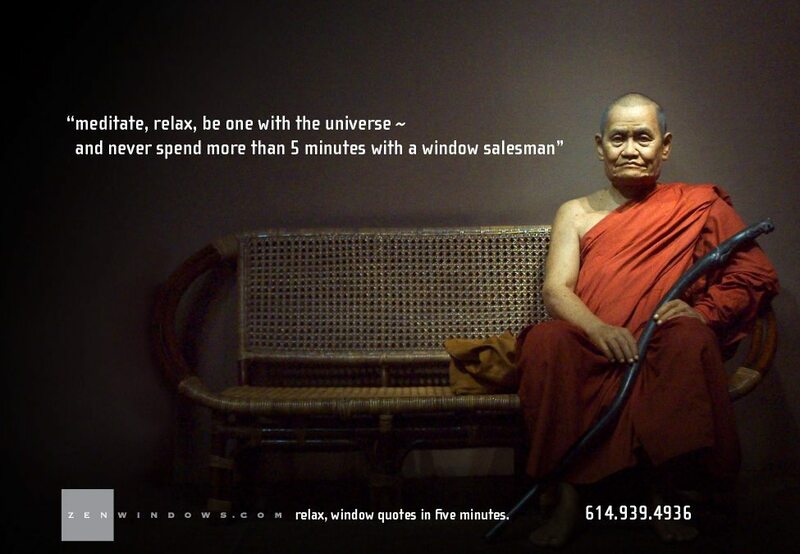 The client eventually became successful enough with the Zen Windows brand to franchise it nationwide. While this presents a profit opportunity with minimal overhead, the franchisees are still ambassadors of the brand. To help support the franchises with appropriately branded materials such as installer shirts, business cards, yard signs, and even boilerplate email templates, we built the Zen Windows Brand Store. Retail brand marks need to be easily identifiable. Whether in a magazine, billboard or the web, the mark needs to instantly conjure up the identity of the client. For Mendelson’s we juxtaposed a retro design 3D type effect with the bold red M. It is a mix of old and new, much like the items the client sells. It gives this discount liquidator the strong image they needed for quick identification. Back to school sales can bring dread to students and parents alike… the cost, the crowds, the expense! This ad targeted college students who have even more needs and larger expenses than a K-12 pupil. Our task was to showcase the thriftiness of our client’s store as well as the vast array of items available. Mendelson’s is the first place to look for every last thing (hey we wrote that!) and this ad demonstrates that. 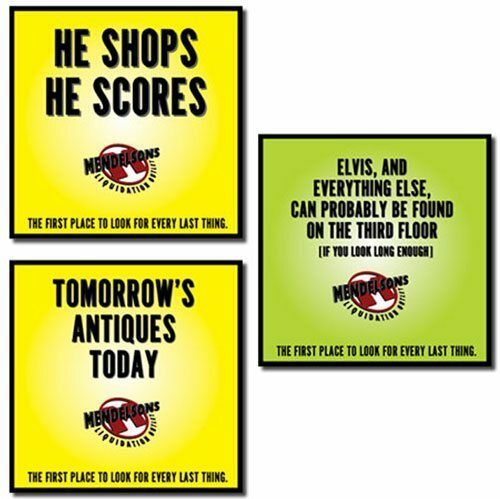 Amusing headlines like “Elvis shot his” kept customers engaged in reading the ad as well as letting them see the breadth of items available at the sale. When we’ve finished making a successful TV campaign for a client, we don’t like to let people forget it. To capitalize on the unique features that makes Mendelson’s an adventure we created these ads. For one year they could be seen motoring around on 10 buses in the Dayton area. “Bubba”, the smiling explorer became a local icon and an amusing reminder of the unexpected shopping experience that awaits you at Mendelson’s. Mendelson’s is a place where you can expect to find the unexpected. Our goal was to create a series of ads that captured the same experience of discovery and anticipation that one gets from searching through our client’s store. These print ads ran one at a time, consecutively, allowing readers to look forward to something new and humorous with each new installment. They are witty and cute and play with a wide range of references and items, all of which are available at our client’s store. A children’s rhyme for dog toys, a suggestive new year’s resolution for mannequins and the hardest working man in show business for bags… these cheeky ads kept the customers coming back. Expedition — This is the TV spot that started it all. The introduction of the “explorer” character who embarked on “one of life’s great adventures” roaming the regions of Mendelsons. The pith helmet, vest and attitude set the way for a whole series. Some people actually came in asking about the US Geological Society field office. Energy Bar — Wouldn’t you just know it…right after this spot started running, Mendelsons liquidated a bunch of energy bars and started selling them at the front desk. Getting lost up here wasn’t really a joke, it was possible, which made the television spot resonate with those who knew the store and made others wonder. Dot Gone — The client wanted dollars off and brand names. We wanted to concentrate on the message. In what turned out to be one of our last spots for the retailer, we tried to compromise by getting both in. We believe the success of our campaign was based on the unique qualities of the store, not price. Anyone can match your price, but no one could match the experience. You be the judge, which do you think would make you more likely to shop there?